What is a Labor Type. How to create a Labor Type. How to edit a Labor Type. How to change your global Labor Type rates in a Quote. What is a Labor Type? A Labor Type is made up of the following information. Name - This is generally how you refer to this type of labor and is how it is displayed in Proposals. Ex. "Installation" or "Programming". Phase - The installation phase this labor is completed in. 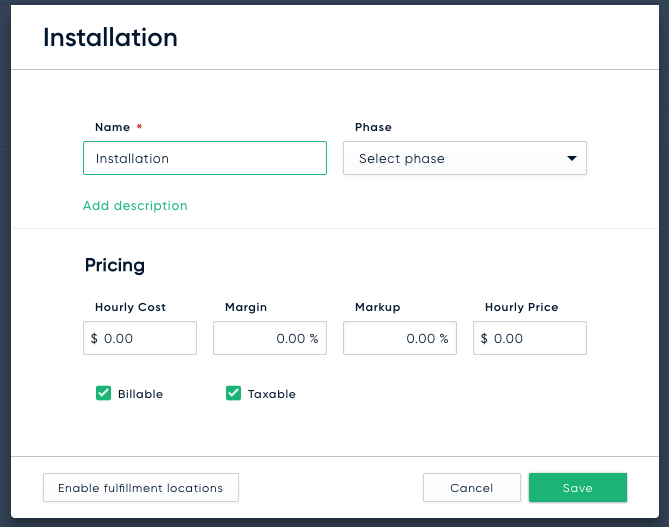 Hourly Cost and Price - This hourly "rate" will be used against a duration of time to calculate your estimates when this Labor Type is used in the Catalog or in a Quote. Taxable - Is this labor taxable? Billable - Is this labor billable? You can create as many Labor Types as you would like. As part of the process for adding a labor to a product, you will first be asked to choose a Labor Type. A Labor Type itself is not labor, but instead is a global definition of a type of labor that is then combined with a time estimate (hours, minutes, and seconds) and an optional project phase to include labor on an item. To create a Labor Type, navigate to Settings through your avatar in the bottom left of the application. Then navigate to Labor Types under the Catalog group. 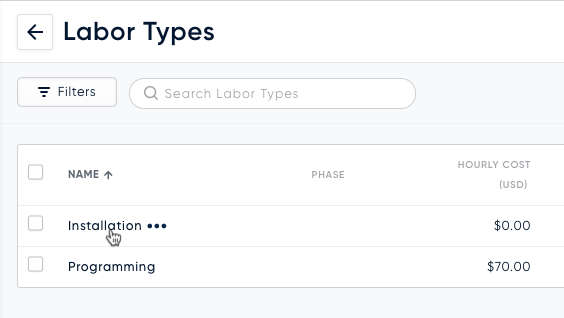 Next, click the "New Labor Type" button in the app bar to begin creating a new Labor Type. 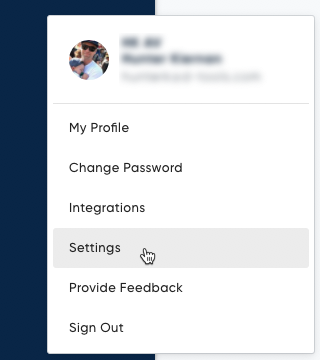 The name you assign will show up in reports, proposals, and dashboards. Phase is optional at this point and serves as a default selection when this labor type is used to assign labor to products, services, and allowances. It can always be overridden. 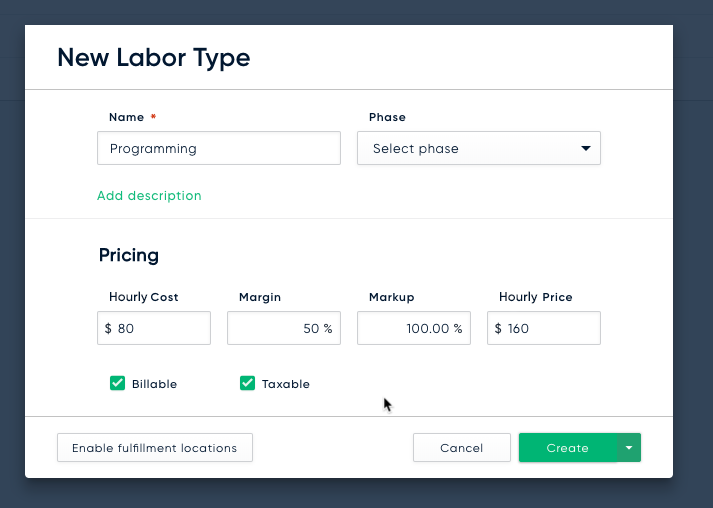 A description can be added to the Labor Type to help differentiate between labor types in the list. After creating your labor type you are ready to create as many labor types as you feel are necessary to track the various categories of labor you sell. To edit a Labor Type you follow much the same approach as you do for creating a Labor Type. 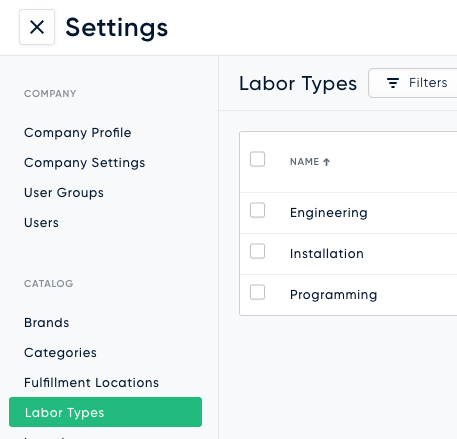 Start by navigating to Settings and then choose the Labor Types option under the Catalog group. Next, you can click on any existing Labor Type to view edit all information related to the Labor Type. Note that when you hover your cursor over an existing Labor Type a "More" option, displayed as three horizontal dots, appears which gives you quick access to "Edit", "Duplicate", and "Delete" actions. Up until now, all of the Labor Type management we have been performing has been at a global level. Changes made to these Labor Types will be automatically reflected in your Catalog however they will not change any current Quotes. When adding labor to a Quote, we "freeze" that rate specific to that Quote. The labor rates for each of the Labor Types being used in a Quote can be managed separately from the global list allowing you to increase or decrease your labor rate specifically for a single Quote, without affecting the global list. To see the current list of Labor Types used in a Quote, first navigate to a Quote. Next, click the "More" menu found in the Quote's header and choose "Settings". In the dialog that is displayed you will find a list of all current Labor Types used in the Quote and you have the option to edit these labor types as you did in the global list - however these changes only affect this Quote.